For those who know Vintage Oaks, the community stands alone. Between the idyllic location right on the Texas Wine Trail, the resort-style amenities, and the scenic acreage properties, Vintage Oaks is simply unmatched. And now, the community is getting even better. Introducing The Reserve, a whole new way to love Vintage Oaks. It's time for March Madness, and you know what that means: bracketology has taken over! Everyone is following their favorite NCAA basketball team and hoping they'll end up on top. At SouthStar Communities, we know a few things about being on top. Our history of success is well-documented with some of the most esteemed master-planned communities in the nation, and our Texas communities are only furthering a reputation for excellence of which we are extremely proud. 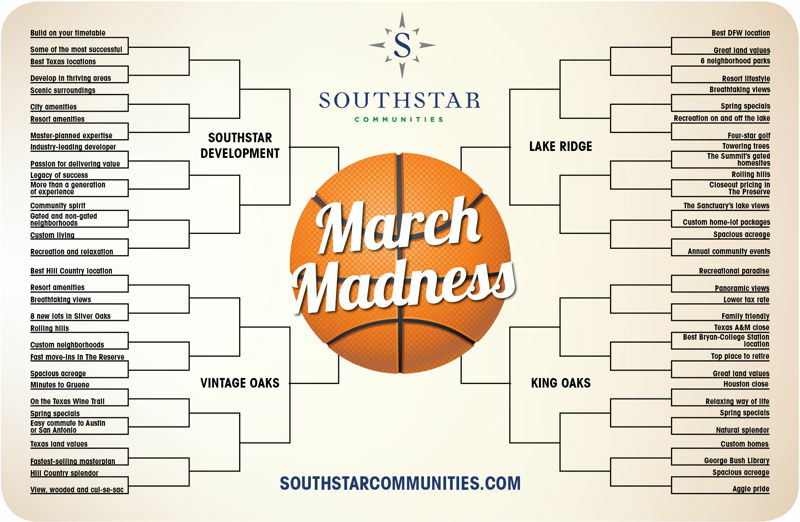 So it only seemed natural for us to create our own March Madness: 64 Reasons to Love SouthStar Communities! March Madness captures the attention of the sports world for the entire month of March—and then some, since the final game is not actually played until April. But Vintage Oaks has residents’ attention every day of the year. 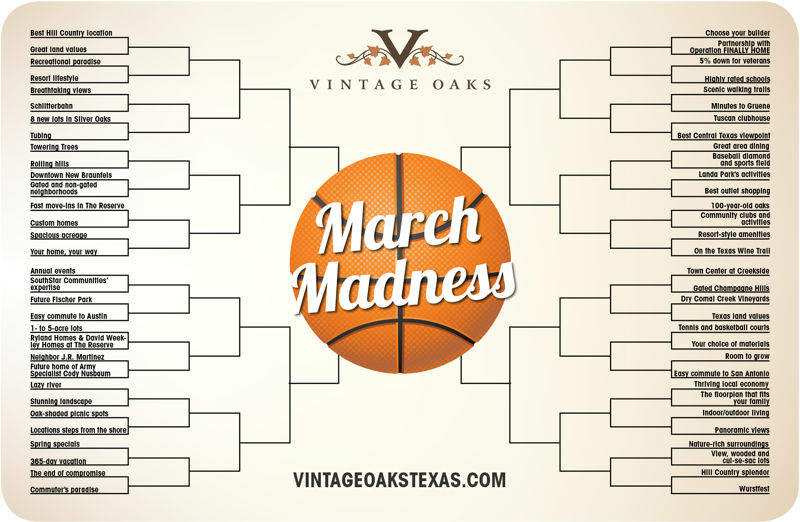 So it only seemed natural to create our own March Madness: 64 Reasons to Love Vintage Oaks! If you’ve been to the Texas capital, you know it’s teeming with food trucks, and these Austin food trucks have some of the best eats in the city. If you’ve watched Jimmy Kimmel, you know he doesn’t pass up an opportunity to take a city’s best features and use them as comedy fodder. Last night was no different. Jimmy Kimmel had some fun with Austin’s food trucks, sending show regular cousin Sal out to the Kebabalicious truck, where he proceeded to harass and annoy patrons. If you missed last night’s episode, you can catch the Jimmy Kimmel Austin food truck hilarity here. And make sure you tune in tonight to see what Kimmel has in store. If you’re in Austin for SXSW, don’t forget to head out to the Texas Hill country and check out what makes this a favorite Texas location. From the rolling hills to the majestic oaks to the allure of the Texas Wine Trail, the Hill Country is a world unto itself. 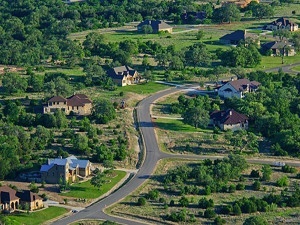 And at the center of it all is Vintage Oaks, the fastest-selling community in the Texas Hill Country, offering a unique combination of Texas land and master-planned amenities. Silver Oaks, offering 1- to 2.42-acre properties with some of the most breathtaking views of the Hill Country’s rolling terrain and majestic oak trees. 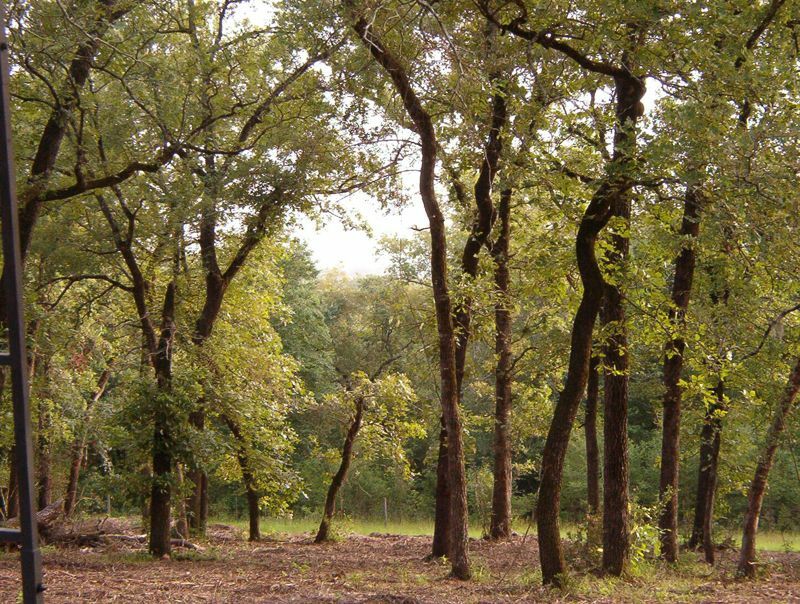 Wooded, cul-de-sac, and view homesites overlook the Hill Country landscape and are dotted with hundred-year-old oak trees. Silver Oaks is within walking distance to many of Vintage Oaks’ amenities, including the Clubhouse, swimming pools, athletic fields and walking trails. The neighborhood is also a short walk from Comal ISD’s proposed school site. 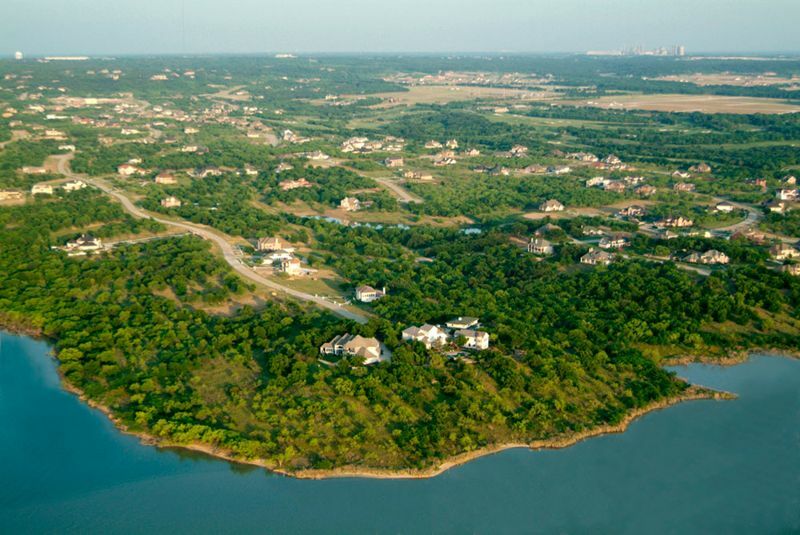 Champagne Hills, Vintage Oaks’ first gated community in more than two years, offering some of the most spectacular Hill Country views and a rare air of privacy. The homesites also offer huge oak trees, heavily wooded landscapes, private cul-de-sac sites and green belt locations with direct access to the community’s walking trails. 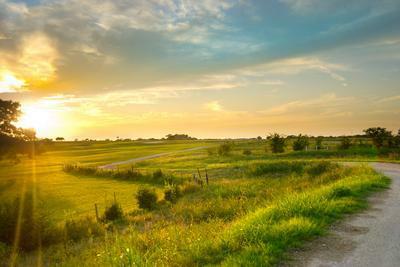 The Reserve offers a unique opportunity for homebuyers to call Vintage Oaks home in a whole new way. It’s the best of Vintage Oaks living plus the ability to choose from a variety of home plans from two of the nation’s most respected builders, David Weekley Homes and Ryland Homes. For more information on Vintage Oaks, visit Vintage Oaks. If it seems like Jimmy Kimmel is eating his way through Austin, it’s because he is. Or was. Maybe both. 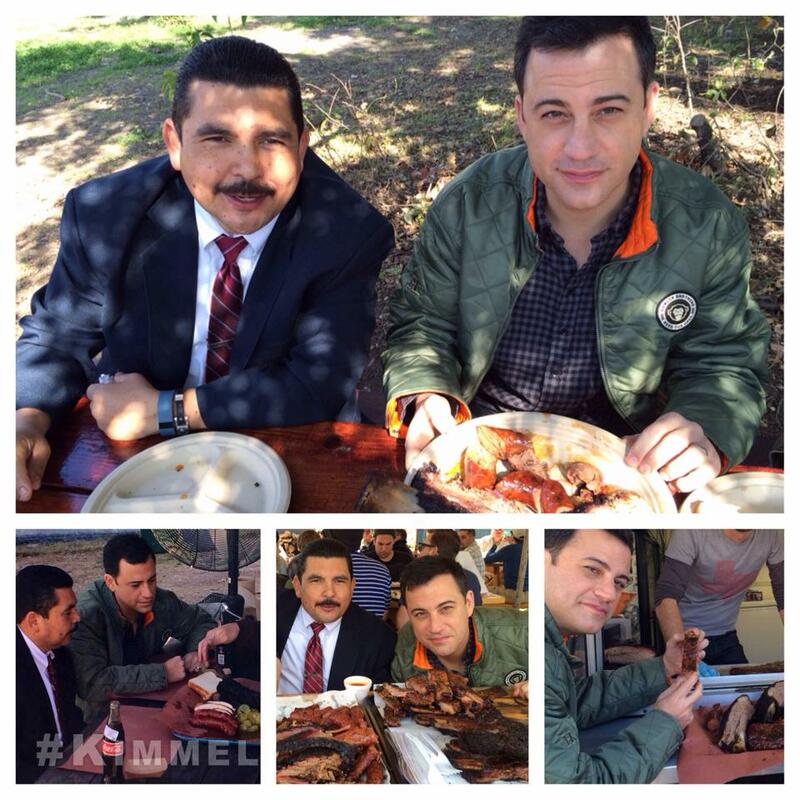 The late night host and his sidekick Guillermo were in town a few weeks back working their way through the city’s best barbecue joints. While the rest of the country tries to find its legs in the post-downturn world of real estate, Texas continues to truck along. The Texas Association of Realtors’ 2014 Texas Home Buyers and Sellers Report shows that Texas outpaces every one of the other 49 in both median household income growth and new-home sales in 2013,” said HOUSINGWIRE. This Sunday is the Academy Awards, and to celebrate, we’re taking a look at all the award-caliber features of the best-selling community in the Texas Hill Country: Vintage Oaks. From the incredible location along the Texas Wine Trail to the range of master-planned acreage properties, Vintage Oaks has it all. So without further delay, we present the Academy Awards of Vintage Oaks.